After a few switches and the elimination of many Malolos, the tribes merge! What this also means is everyone is immersed in the Domenick vs. Chris beef which cannot be squashed despite a Wendell intervention. A head-to-head is brewing, but it'll take some Survivor magic or strong alliances to save them. Domenick has his Hidden Immunity Idol, a fake idol, and the Legacy Advantage. Chris initially has nothing but poor rapping skills, but he's able to successfully obtain a JT's unplayed Game Changers Hidden Immunity Idol on a secret mission to Ghost Island thanks to a discrete clue in his merge buff. 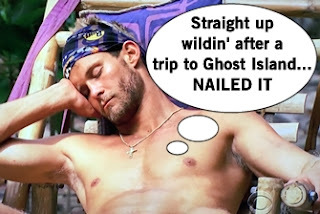 It's not all good stuff though as Chris loses his ability to vote in the next Tribal Council in a chance to extend the life of the idol (now good for two Tribals). But if both rivals have idols, which poor Survivor might fall in the potential idolgeddon coming? It won't be Kellyn who wins the first Individual Immunity of the season, a feat of endurance to balance a lil' tiki on a pole while also balancing themselves on a narrow beam. She gets to wear the sacred necklace which is the most underwhelming piece of victory I've seen but I guess they spent all their focus finding old idols instead of constructing new ones. I digress; back to the show. 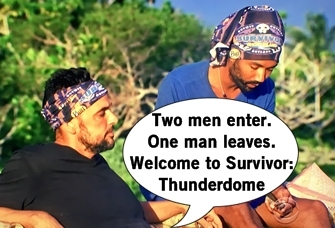 Chris convenes the majority of Lavita, the newly named merged tribe, to tell them to vote off Domenick, but throw a few votes Wendell's way in case an idol is played. Dom and Wendell confide in each other about their idols and agree to play them, then work on the counter-play to get rid of Chris instead. 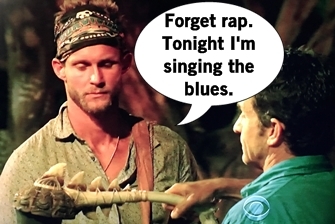 And then there's Kellyn who thinks they should pick off a Malolo again because of course. Which side of the war will win? Tribal Council time! Chris lights his torch for the first time because it's his first ever Tribal Council - let's give him a round of applause. Probst talks about trusting your gut and adapting your game, which of course leads to a discussion of Dom vs. Chris and also the missteps along the way to make them enemies. Wendell brings up that him and Domenick were left out of the strategizing today, and Angela says she'll roll with the majority and hints maybe smaller plans could be in effect too. Kellyn and Chris both have similar sentiments in trusting your gut and the alliances you've made, so time to test that. The tribe votes, where Domenick audibly shouts his vote against Chris and Wendell gives the most spectacular speech imploring Chris to never wrap again. Probst tallies the votes and Domenick plays the Legacy Advantage willed to him by Morgan, since it's only good for when 13 or 6 players remaining. Any votes cast again Dom would be null, but there are none. There are 2 votes for Libby and the rest for Chris, who walks out the game with an unplayed idol in his pocket. A doubly cursed relic for Ghost Islands of the future!